The leaves of Sasanqua Camellias are much smaller and dense than the Japanese Camellias, making for a smaller more compact shrub. Like the Japanese Camellia Sasanqua Camellias need a moist acidic soil. The Shi-Shi Camellia is a late bloomer and its form is low spreading. 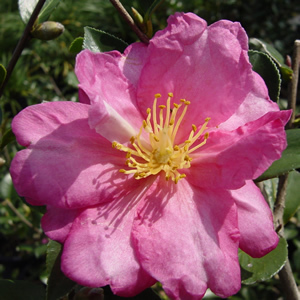 The flowers of Camellia sasanqua ‘Shi-Shi Gashira’ are semi-double and deep pink or rose in color.